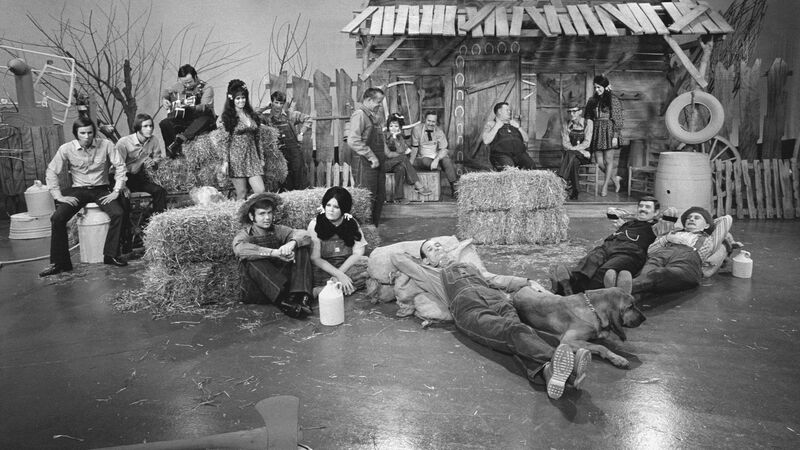 Here's where to watch every episode of Hee Haw season 9. Mouseover or tap an episode to see where to stream it. Click or tap the play icon to stream it on the best available service. Kenny Rogers, Jana Jae Oct 1, 1977 Kenny Rogers performing "Lucille" Buck Owens & The Buckaroos performing "The Old Mansion" Jana Jae performing "Here To The Ladies"/Irish Washer Woman" Medley The Hagers performing "Brand New Country Star" Cathy Barton performing "Red Wing" Roy Clark performing "Half A Love" Kenny Rogers "Day Time Friends and Night Time Lovers" Lulu Roman performing "Light At The End of The Darkness"
Jerry Reed / Sammi Smith Oct 9, 1977 Music: Jerry Reed - "East Bound and Down." Jerry Reed, Buck Owens and Roy Clark - "Bully of the Town." Sammi Smith - "Loving Arms." Sammi Smith - "All I Ever Need Is You." Buck Owens and the Buckaroos - "Tumbling Tumbleweeds." Jimmy Henley (banjo player) - "Dear Old Dixie." Dennis Weaver / Eddie Rabbitt / Jana Jae Oct 29, 1977 Music includes: Eddie Rabbitt - "I'm a Little Bit Lonesome." Eddie Rabbitt - "We Can't Go on Living like This." Roy Clark - "I Don't Know How to Tell Her." Buck Owens and the Buckaroos - "I Washed My Hands in Muddy Water." Loretta Lynn / Sons of the Pioneers / Ernest Rey / Russell Knight Nov 5, 1977 Music: Loretta Lynn - "Why Can't He Be You?" Loretta Lynn - "She's Got You." Sons of the Pioneers - "Tumbling Tumbleweeds." Sons of the Pioneers and Roy Clark - "Carry Me Back to the Lone Prairie." Ernest Rey - "Trixie." Jana Jae - "Cripple Creek." Roy Clark (on guitar) - "Lazy River." Sonny James / The Oak Ridge Boys / Bob Montgomery / Kenny Price Nov 19, 1977 Music: Sonny James - "Bright Lights, Big City." Sonny James - "When the Snow Is on the Roses." The Oak Ridge Boys - "Y'all Come Back Saloon." Kenny Price - "Blueberry Hill." Jana Jae - "Chicken Reel." Buck Owens and the Buckaroos - "Break My Mind." Roy Clark (on guitar) - "Near You."